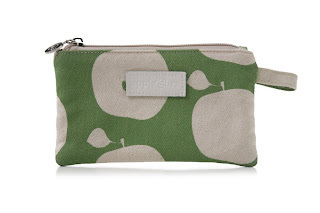 How cute are these makeup bags?! And they don't just look fun and classy, they'll make you feel good too. Apple & Bee cosmetic, travel and baby bags are made from Earth-friendly materials like certified organic cotton, bamboo silk and hemp. The Australian company also created The Bee Foundation, a non-profit that raises money and awareness for the honey bee population. This week, two of you will win one of the makeup bags shown above: their Foldout WC in Apple Blossom Red (made with organic cotton on the outside containing three waterproof compartments and a hanger hook) or a Small Make-up Bag in Delicious Grass Green (also made with organic cotton on the outside and lined with hemp). The foldout can hold all your makeup goodies while the smaller one is perfect to bring along your essentials on those overnight stays. Just leave a comment below and two winners will be randomly chosen Thursday night! 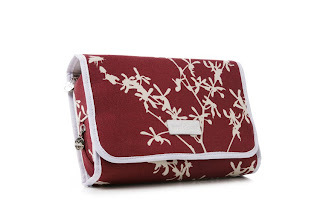 CONGRATULATIONS: Evelyn (Foldout WC) and Emmy (Small Make-up Bag) are this week's winners! Please please please!!! Send me my new makeup bag!! I just went on a hunting spree this weekend for new makeup.. the bag will mak eit complete! those are so cute. what girl doesn't need a new cute makeup bag. sign me up. Those are cute! Mine is so dirty and disgusting, I need a new one. Hope I win. OMG!!! Me!!!!! Mine is absolutely disgusting! These are too cute.....and I NEVER win anything lol...like in life...so hook me up! gosh girl, you have great giveaways! i'm crossing my fingers to win this one! woohooo! They are so cute! What a great find! I can't wait to browse more! Woo Hoo count me in!! These are SO adorable!! Oooh I likey! The red one is so cute. Gosh, I just love the red folded one.